My short life had not been a pleasant one, I have lived outside my entire life. I have a hernia so large that they say my intestines could fall out and my right rear leg was broken when I was around a week old and it was left to heal on its own. My breeder sold me to a family telling them my leg would not be a problem but when they took me to their vet he disagreed so I was returned to the breeder. 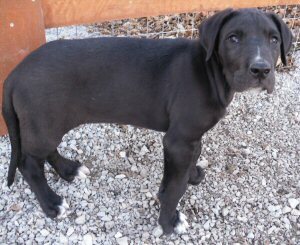 When my breeder realized I could not be sold they contacted Harlequin Haven Great Dane Rescue and asked if they would take me. Luckily the rescue agreed. The rescue wasted no time taking me to the veterinarian, within 24 hours of arriving at the rescue I was at the vets getting x-rays. On Monday I will see a surgeon about having my leg repaired and my hernia fixed. I now am inside and have a really soft bed and tons of toys to play with!! What a treat to be inside on a soft bed surrounded by toys! I'll keep you posted. I feel so good living inside and am very anxious to hear what the surgeon says on Monday. Update November 16: Warren will have surgery this afternoon. His leg will be re-broken and set with plates. Update November 17: I had my surgery yesterday and am home now. I am doing great and feeling really good considering I had surgery yesterday. Grandma promised to take pictures later today so I can show you all my really neat bandage!! I will go back to see the vet next week for a check up then in 10 - 14 days my stitches will come out. Then I get to have another surgery to fix my hernia and be neutered. Well I gotta go and play with my toys because being without all my toys for a day was really tough!!! Update November 18: Sorry for the delay with the pictures but after I played yesterday I realized how tired I was and well I decided to sleep instead of having my picture taken. My new pictures are below. Grandma says I look like a different boy and I just think I look cute!!! Okay gotta go eat lunch I am starving!!! Update November 24: I had my first recheck since my surgery and the vet was thrilled at how well my leg is doing!!! I am just happy that I am no longer in pain! I go back next week to have the stitches taken out, then in a month or so when the bone is totally healed I can have my hernia surgery!!! Update December 5: I had my stitches taken out on Thursday and all continues to go well with my leg. They can not believe how well my leg it doing!! I keep telling them I am just a happy healthy puppy but I think old people just like to worry! Oh well nap time, ya know I need my beauty rest! Update December 19: The upcoming weeks are going to be very exciting!! First off my leg continues to heal and I continue to play! Then the first of the year Grandma says I will get neutered and get my hernia repaired then I should be ready for adoption. Heck I will be all brand new!! Plus and the most exciting event is that on December 25 some man by the name of Santa Claus will be coming and bringing all the good boys and girls new toys to play with!! I know I have been a very good boy so I know I will get new toys!!! Grandma says that I have to leave some cookies out for Santa Claus as a gift in return! Heck I think that is a pretty good deal!! Well now I am going to go eat my cookies and play with my old toys!! Only 6 more days!!! Update December 26: I just wanted to share some of my Christmas pictures with you! Scroll down to see my new favorite Christmas toy!! Also I get my hernia fixed an get neutered this coming Thursday!! I can't wait! Update January 2: I was neutered last week and had my hernia repaired and the vets office gave me the all clear! I am NOW ready for adoption!!!! Grandma says I am the bestest pup ever!! 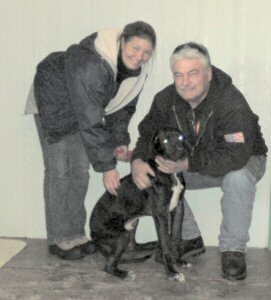 ADOPTED: I have found my forever family and life is wonderful!!! They are the best family!! They love me as much as I love them!!! !